The side-channel pumps are selfpriming and operate more economically (better efficiency) than normal centrifugal pumps when handling low flows and high heads. Due to these facts, the side-channel pumps are appropriate to solve many pumping problems in industrial processes. They can be used for almost all liquids which are free of any abrasive solids and of suitable viscosity. Application limit for selfpriming design is 115 cSt. diameter of max 2,5 m (8.2 ft). The design of the pumps allows an installation directly on the dome cover. That means, suction lift is only slightly above the tank diameter and the suction pipe can be kept short. The maximum allowable operating pressures are 6 bar(PN6) and 10 bar (PN16), the maximum operating temperatures are 100°C (212°F). 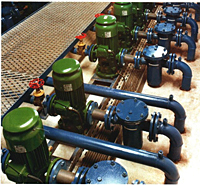 The WPV-types are single stage, single flow, selfpriming Inline-pumps. The opposite located suction- and discharge flanges have identical nominal diameters. The pump consists of the socket, the suction and pressure disc, the bearing housing with mechanical seal and the impeller. For the sizes 25/35/40 a design with oval flanges PN6 and impeller arrangement without SiC-rings is available. The hydraulically balanced side-channel impeller is keyed to the extended motor shaft and located in a chamber between the socket and the suction and pressure disc. To achieve selfpriming capability, best efficiency and differential pressure, tight clearances between the rotating impeller and the stationary pump parts are required. To avoid seizing of the impeller due to the tight internal clearances, the pumps are fitted with additional wear resistant SiC-rings. The SiC-rings are placed in the suction and pressure disc as well as in the impeller hub. The impeller is pushed concentric to the ring in the disc by the spring and the support ring. With this design, a clearance is guaranteed between impeller vanes and the stationary parts. Metallic contact between the parts and seizing is excluded.